•	changing the Websites or Services, including terminating, eliminating, supplementing, modifying, adding to or discontinuing any content, functionality, promotion, data on or feature of the Websites or Services or the hours that the Websites or Services are available. NewspaperLists reserves the right to change these Terms of Service from time to time. We will usually inform you of any changes by posting the updated Terms of Service on the NewspaperLists website. If we make any material changes to these Terms of Service, we will post a notification on the NewspaperLists website and, if you are a Member, notify you via email and/or by asking you to review the changes to these Terms of Service the next time you login to access the Services. Your continued use of the Services after the time the changes are communicated as set out in this section will indicate your acceptance of the Terms of Service, including those changes. The Websites may include links to other websites or services (including advertisements and payment providers) solely as a convenience to you ("Linked Sites"). The inclusion of any Linked Site does not imply endorsement by NewspaperLists of any third party, third party websites or any association with the operators of such Linked Sites. You are responsible for viewing and abiding by the privacy statements and terms of service/use posted at any third party or Linked Sites. 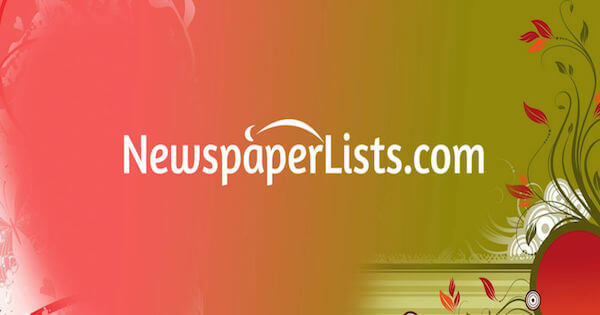 The information, products, materials and services on Linked Sites is not under the control of NewspaperLists and NewspaperLists does not provide or endorse any such Linked Sites or the information, products, materials or services contained on or available or accessible on or through any Linked Sites. NewspaperLists responsible if any Linked Site is not functioning properly. NewspaperLists makes no express or implied warranties with regard to the information, products, materials or services that are contained on or accessible through any Linked Sites. Access and use of any Linked Sites, including the information, products, materials and services on any Linked Sites or available through any Linked Sites, is solely at your own risk, and you acknowledge and agree that NewspaperLists is not responsible or liable, directly or indirectly, for any loss or damage caused or alleged to be caused by your use of any or dealings with any Linked Site or as the result of the presence of any advertisers on the Websites or available through any Third Party Platforms. Your correspondence or business dealings with, or participation in promotions of any advertisers found on or through the Websites, including in or through the Services, are solely between you and such advertiser. Any dealings with third parties, such as advertisers, included within the Websites or available on or through any Third Party Platform or participation in Promotions (defined below) involving the delivery of and payment for goods and services, or any other terms, conditions, warranties, or representations associated with such third parties, are solely between you and that third party. NewspaperLists is neither responsible nor liable for any part of such dealings with any third parties, including any Promotions. You hereby agree and acknowledge that : (a) NewspaperLists has the right to obtain without notification to you certain information about your computer or software, including without limitation, your operating system, identification of your hard drives, central processing unit, MAC address, IP address, and Internet browser for purposes of identification and other lawful purposes; (b) NewspaperLists has the right to obtain without notification to you non-personal information from your connection to the Websites, Services or through any Third Party Platform for demographic or any other lawful purposes; and (c) NewspaperLists has the right to obtain without notification to you information from your computer, software, and parts or portions thereof, including without limitation, your computer's random access memory, video card, central processing unit, hard drive(s) and any other storage devices in order to assist our efforts in policing users who may develop and/or use "hacks." The information obtained in this Section may be used for the purpose of identifying persons or entities not in compliance or believed by NewspaperLists to not be in compliance with the Terms and any and all other NewspaperLists Standards, rules, policies, notices and/or agreements. You acknowledge and agree that you (and not NewspaperLists) are responsible for obtaining and maintaining all telecommunications, broadband, and computer hardware, equipment, and services needed to access and use any service provided by NewspaperLists, including without limitation, the Websites, Services, or any Third Party Platforms, and paying all charges related thereto. You also acknowledge that you are responsible for obtaining and maintaining your access to any website through which you access NewspaperLists's products or Services, including the Websites and any Third Party Platforms.